Photo announcements can show a preemie baby progress. 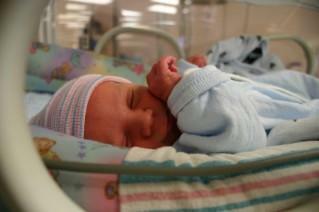 Sending out preemie birth announcements can be a complex issue for many parents. After all, you want to celebrate in the arrival of your child(ren), but you may also be worried about any potential problems resulting from the premature birth. When to send out the birth announcement is often a tough decision for parents of preemies. Health concerns for the preemie development may make some people hesitant to send out joyous cards the week after the birth. Early arrivals often spend time in the NICU (neonatal intensive care unit), and sending an announcement could give the impression the baby has come home. The announcement could also be sent once the premature baby has been cleared of all major health problems. Depending on how early the baby is, it could be over a month before he gets sent home. Visitors are often limited at intensive care units, and friends/relatives will be eager to hear about the baby's progress. Sending out an announcement after passing the danger stage is a good compromise for infants who will be spending a lot of time in the NICU. Modern families often send out photo cards as birth announcements. Just because you have a baby in the NICU does not mean you are left out of taking beautiful newborn baby photos. Check with your hospital and begin calling local children's photographers. Many professionals have experience working on locations other than their studio and will be able to capture precious moments of a preemie's life. They will also have knowledge about how to position and hold the baby to cover any machinery that you want to hide in a photo. Of course, breathing and feeding tubes and other apparatus should not be removed just for a nice photo. Taking your own announcement photos can make for a touching card. Pictures of the parents holding the newborn, a shot of the tiny fingers and toes, and a close-up of the child's face are all traditional birth announcement shots that are perfectly appropriate for preemies. If you are sending out a birth and homecoming announcement, making a photo montage can be a great way to showcase your infant's health improvements. Put the preemie growth information next to each shot for an additional look at his progress. Birth announcements are usually sent to friends, family and acquaintances. Those who are not in your inner support circle might not realize that the baby was born prematurely. You can write your own announcement detailing information about the birth. Tailor it to your own situation and personal feelings. The stork stopped by early . . .
A preemie miracle arrived on . . . The twins (or triplets) were fighting over their womb, so they came early and demanded their own room! Little Jackson Luke couldn't wait; he came almost 5 weeks before the date! Her hands and toes might be small, but Maria Ann has enough love to fill us all. Whatever new baby sayings you choose to include in your announcement, make sure it fits with your family's personality. If you are doing a more sentimental or religious photo announcement card, choose sayings from religious texts or newborn poems. For a family who is optimistic and fun-loving, a cute rhyme may be just perfect. You can make your own announcement, ordering online through photo retailers like Winkflash and Shutterfly. If you are awaiting your child's release from the NICU, you might consider making a scrapbook announcement to help pass the time. Ordering personalized announcements online is an easy way to get personalized attention and service. You often get the chance to include multiple photos and information for a low price. These announcements are great to put in baby albums as a keepsake. You can purchase announcements on sites like Etsy. Working with a retailer who has experience with preemie birth announcements can help you create the right card for your baby and situation.